Earlier today, we brought you the ten best plants for apartment dwellers. But now you need somewhere to put your greenery, and we love the idea of incorporating dry humor and edgy design into the items we select to decorate our homes. Wyatt Little, a Texas-based product designer, takes an unorthodox approach to design, using uncomfortable and unfortunate life experiences and translating them into physical products everybody can relate to. 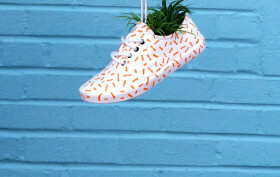 His planters range from shoes hanging on power lines to Slinkies, but they maintain an artistic beauty that would work well with any piece of greenery.